Birding is a pastime that can be affordable, healthy, and adventurous. Birders get outside in autumn and winter weather, walk or hike to remain active, and discover new natural landscapes while pursuing their passion. Spotting new-to-you bird species is often the icing on the cake. A birding outing can easily be added to planned travel, whether for work or leisure. 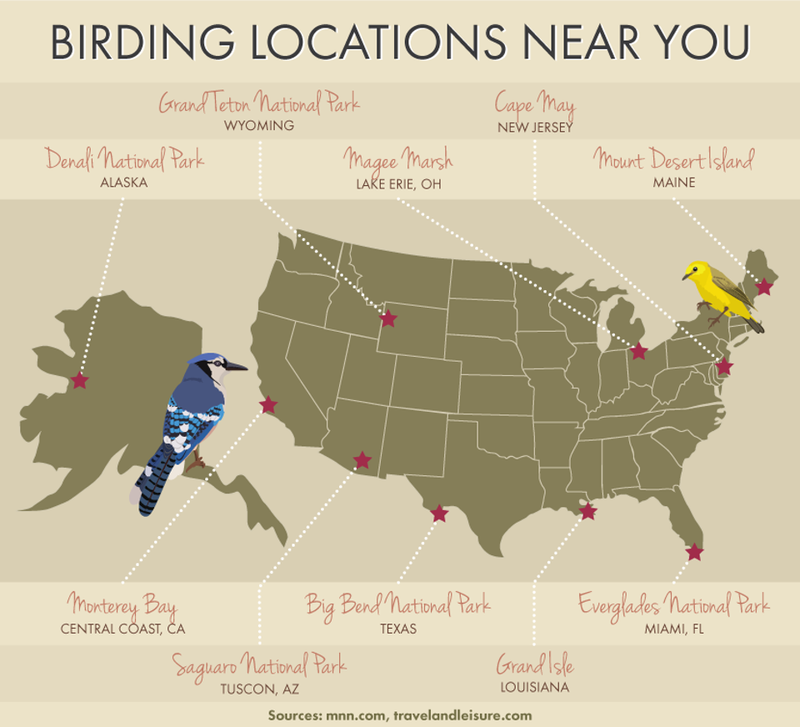 Before your next trip, check to see if you’ll be in the vicinity of any of these top birding locations in the U.S.
Southwest US: New Mexico and Arizona are home to some of the best birding locations in the country. Thanks to wide swaths of remote landscape in both states, huge migrations have room to take flight here in the fall months. In Arizona, head to Cave Creek Canyon, Patagonia-Sonoita Creek Preserve, Saguaro National Park, or Madera Canyon, and in New Mexico, start in the Chupadera Mountains and the Magdalenas, both in the Chihuahuan Desert. Florida: Teeming with bird species year-round thanks to its climate, cypress groves, and swamps, Florida is a birder’s dream. Active bird-spotting is plentiful in Everglades National Park, popular tourist destination Sanibel Island, and Corkscrew Swamp (south of Fort Myers), where the country’s largest stand of virgin cypress trees makes a home for limpkins, wood storks, and swallowtail kites. New Jersey coast: There’s arguably no better place to catch the migration of hawks than Cape May, New Jersey, and thanks to the coastal climate in this part of the country, birders will also find many waterfowl species. Head directly to the Cape May Bird Observatory Northwood Center for the best bird-spotting in this area. Lake Erie: Both the U.S. and Canadian sides of Lake Erie are prime birding locations in the fall and winter, thanks to Ohio’s Magee Marsh and Canada’s Point Pelee National Park, a six-mile stretch and globally important bird area. Freshwater marshes and sandy beaches can be found in both locations, alive with both songbirds and hawks. California coast: On the opposite side of the country, the central California coast offers prime birding in a scenic setting. Head to Monterey Bay to catch a rare glimpse of an albatross, or travel to Point Reyes National Seashore, where a wide variety of sea birds are in plentiful supply, including – depending on the year – puffins. Texas: A neighbor to New Mexico and Arizona, sharing the same prime birding area in the Chihuahuan Desert, several parts of Texas provide big birding opportunities. Try Big Bend National Park, in the Chisos Mountains in the south, or head to the lush green sanctuary of the Rio Grande, which attracts a wide variety of bird species. Be on the lookout for buntings, hummingbirds, flycatchers, and even hawks in the Rio Grande Valley. Now that you know where to go to find the biggest migrations and birds en masse, it’s time to learn where to go for specific species. The following precise locations are known primarily for one bird (though many others may congregate as well). Hawks: Birders interested in birds of prey can head to Central Oregon to the bird sanctuary program at Bend’s High Desert Museum, or to the Hawk Mountain Sanctuary in Pennsylvania, where the fall hawk migration is a big attraction. Interestingly, hawks and raptors have been spotted in Cape May, New Jersey, as well. Bald eagles: Try the Klamath Basin, Southern Oregon, at Upper Klamath Lake and Klamath Basin National Wildlife Refuge Complex. Or you can go north and view many bald eagles at the Alaska Raptor Center in Sitka, Alaska. Cranes and snow geese: New Mexico is the prime location for sandhill cranes and snow geese. Birders who arise before sunrise will be rewarded with the sight of over 10,000 birds taking flight each morning. The best viewing location is Bosque del Apache, below Albuquerque and not far from the Chihuahuan Desert region recommended above. Hummingbirds: Various types of hummingbirds are notable in several regions of the American Southwest, including the Aransas National Refuge in Texas, known for ruby-throated hummingbirds, and the entire Southeastern section of Arizona (as noted above), known as the “Hummingbird capital of the U.S.” At Aransas, birders will also be rewarded with Whooping Crane sightings. Orioles and jays: Stay in Texas for the best orioles and jays, which congregate in fall in the Lower Rio Grande region, enjoying the vegetation and water options in this section of the state. Continue reading, Birding: Migrating to Birding Locations This Year, from FIX.com here.